Whoo Hoo! I did my first Xcross Race Today! And I didn’t fall down! I’m not sure how I did but I don’t think I was last AND I think I was the oldest participant so I am pretty happy about it. 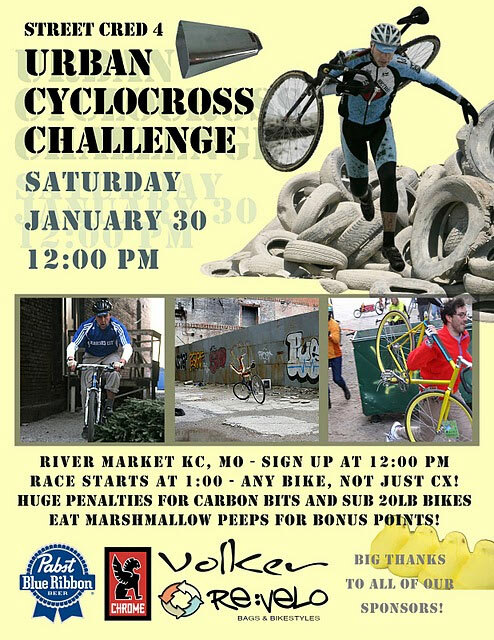 Granted, it was the Urban Cyclocross Challenge in the West Bottoms of KC, MO, so it was far from a traditional cyclocross race – BUT, my bamboo bicycle performed great and I even did a cyclocross running dismount. My re-mounts need work to say the least but great fun was had by me and all who attended. It was a gorgeous, sunny day. Perfect for being outside. It was in the high 20’s but no wind to speak of. I couldn’t feel my toes by the end of the race but other than that, it was very comfy for riding a bicycle. I have movies on my camera that someone took for me so I will edit those and put them on my Flickr page next week. I scrubbed, lubed, and waxed (yes, I wax my bike) the bamboo bike when I got home so it’s ready to go. I also re-set my computer so I’m starting at zero miles today. Now to start working on my 2,010 miles this year. Tomorrow it’s back to sewing some bags!!! I’m way far behind on getting them done and re-creating my store on this site. Argh. Stage 4 is TOMORROW. NOW IN THE WEST BOTTOMS. Meet at the corner of Hickory and St. Louis. Mark your blackberries, iphones, daybooks, territory…just remember to be there! I hear they’re serving peeps and beer. Come on out and test your legs in this January 16th crit race in Kansas City, MO. Sign up at 12:30pm, race at 1pm. James B. Nutter parking lot, 4153 Broadway. You look sexier in a helmet, so wear one. And bring $5 . Prizes include my Re-Velo bags (Which ones? You need to show up to find out.) so what better reason to ride your bike on a cold day through the mean streets of KC? Hopefully the snow will be gone by then or it could get interesting. Oh, I’m sure it will be interesting no matter what. Hope to see you there! Need more info?